Need to stock a dungeon but don't have time? Want new ways to use favourite monsters? Don't have the head for number-crunching levels and templates? 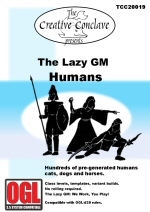 The Lazy GM series is for you. Each PDF file is crammed full of pre-generated sword fodder for your players to slaughter, with hundreds of entries covering all manner of classes, templates, racial variants and advanced monsters. The OGL versions contain material from the Expanded Psionics Handbook and Unearthed Arcana, with wilders, phrenic creatures, savage bards, totem barbarians, elemental and environmental racial types, battle sorcerers and more, whilst the Pathfinder issues include all-new Pathfinder material such as Oracles, Witches and Gunslingers, archetypes, new feats and spells, new templates, creatures from the Tome of Horrors and loads more. Monsters of Challenge Ratings 1/4 to 35. Use the clickable index to select monsters á la carte, or choose from a range of encounter suggestions.  All Open Material for you to cut and paste for personal or business use. 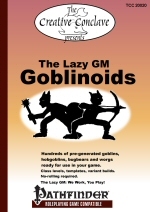 Now available for OGL or Pathfinder. Forty monsters exclusively for Pathfinder, from classics like the Harpy and the Aboleth to oddball monsters like the Disenchanter and the Flail Snail. 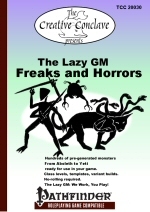 Freaks and Horrors makes good use of the huge array of Pathfinder options available, with archetypes like the Medusa Lotus Geisha, templates like the Nightmare Xill and new classes like the Jackalwere Gunslinger. Also features a wide range of classes and levels for the lesser-used underdark races like the Dark Folk, Dire Corbies and Morlocks, as well as a CR17 variant of the Flumph that your players will take very seriously indeed! Over 360 goblins, hobgoblins, bugbears, worgs and a sprinkling of dire wolves. From goblin archers to a gang of fiendish bugbears, a hobgoblin psychic warrior and a goblin sorcerer mounted on a skeletal worg. We've got them all here. Traditional PDF for only $10. Click here for a 90Kb example of some of the content of this PDF. 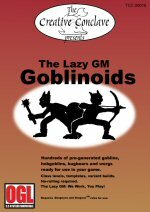 Our classic Lazy GM: Goblinoids gets a Pathfinder make-over. 400+ ready-to-run stat blocks for goblins, hobgoblins and bugbears, with companion creatures dire wolves, goblin dogs, worgs and wolves. 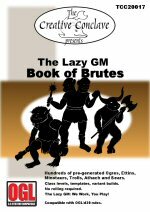 Opponents from CR 1/3 to 17, with class levels, templates and racial variants, now using Pathfinder rules for a whole new exciting range of options, such as the Bugbear Brawler, master of the improvised weapon. Buy now from DriveThruRPG or RPGNow. Traditional PDF for only $10.99! Over 400 stat blocks for 40 favourite monsters. Want a hellhound trained for war? What about a fire-breathing manticore, or a mimic the size of a house? 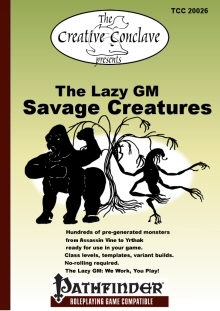 Over 140 pages of creatures from CR 1/3 to 35. Buy now from DriveThruRPG or RPGNow. Traditional PDF for only $9.99! 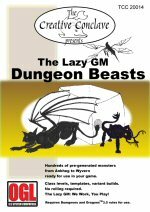 Forty classic dungeon monsters in hundreds of pregenerated stat-blocks, now expanded and updated to Pathfinder. All new templates, all new format, from the Two-Headed Ankheg to the Shadow Terror Wyvern! 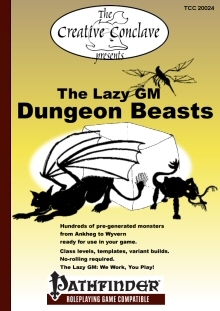 Also featuring the Demon-Possessed Mimic, the Neo-Otyugh Crime Lord and many other alternative monster builds. Almost 200 pages of stat-blocks for forty-one monsters of land, air and sea. From gargantuan assassin vines to half-dragon yrthaks, this book contains hundreds of ready to run monsters. 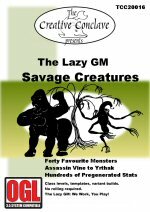 All the usual stuff you've come to expect from The Lazy GM, including templates, variant builds and class levels including Epic and Psionic creatures. Forty-one monsters of land, air and sea, in hundreds of pre-gen stat-blocks for Pathfinder, including loads of new and exciting options. from Ettercap Alchemists to Paleoskeleton Tyrannosaurs, Fey Griffons to Obsidian Gargoyles. 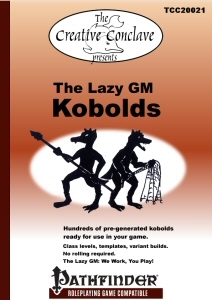 58 pages of kobolds of all kinds and a sprinkling of dire weasels. From kobold scouts to a half-dragon sorcerer leading a gang of fiendish kobolds mounted on vampire dire weasels. We've got it covered. 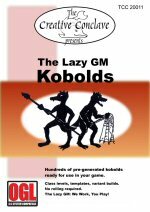 Kobolds for Pathfinder, 171 pages stuffed full of new and updated options such as kobold gunslingers and the greenscale jungle kobold juju-zombie verdant crossblooded sorcerer! Traditional PDF for only $5.99. 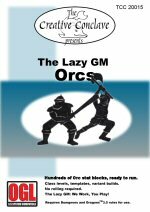 Over 450 stat-blocks across 156 pages of pre-generated orcs (with a few dire boars for good measure). The broadest array yet of classes and levels, with all SRD classes covered from levels 1-12 plus a few beyond. Loads of totem barbarian variants, paragon levels, bloodlines and lots of variant builds including different types of cleric, druid and sorcerer, plus the usual array of templates and builds in easy-to read stat blocks ready for use in your game. You need never create an orc character again. Buy it from DrivethruRPG or RPGNow. Traditional PDF for only $9.99! Put some Big, Dumb and Ugly into your game. Over 400 ready-to-run stat blocks for Ogres, Trolls, Minotaurs, Ettins and Athach, with a side-order of bears of all kinds. From CR 1 to 21, zombie dire bears to half-fiend ettin mystic theurges, or a simple ogre heavy fighter to the scrag were-squid. Includes psionic characters, totem barbarians and more. Over 200 pages with a fully cross-referenced hyperlinked indexing system to take you to the monster of your choice with a single click. Click here for a sample file. Buy now from DrivethruRPG or RPGNow. Traditional PDF for $9.99! 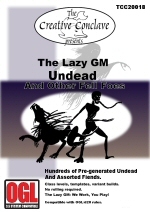 Twenty different undead creatures and miscellaneous fiends, fully statted out with a range of hit dice, class levels and templates, ready for use in your game. From Achaierai to Yeth Hound, 100 pages of over 180 individual stat-blocks. Wight soldiers, ghoulish rogues, psionic wraiths and the were-howler all await within. 58 pages of troglodytes of all kinds and a sprinkling of monitor lizards. 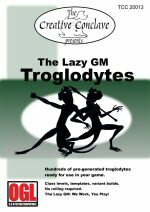 Troglodyte zombies controlled by a fighter/cleric? Brutish trogolodytes led by a paladin of slaughter? A mystic theurge and his vampire bodyguard? No problem. 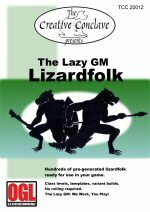 50 pages of lizardfolk of all kinds and a dash of crocodiles for good measure. 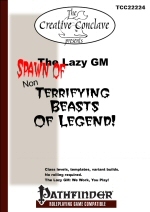 Giant lizardfolk, ghostly druid avengers, skeletal crocodiles and marsh rangers. Over 250 pregenerated stat-blocks for humans, from a town guard to an archmage, from a sailor to a vampire necromancer, all ready to run in any OGL/d20 fantasy game. From CR 1/6 to 25, with class levels, variant builds and templates and a handful of cats, dogs and horses, to cover every human encounter you might need. Traditional PDF for only $9.99. 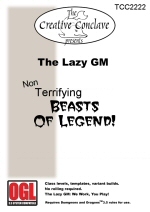 A Lazy GM Charity Special! Which type of rogue are you - Ninja or Pirate? 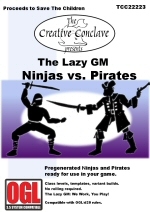 Within these pages you will find over 80 characters, from basic ninja and pirate rogue builds to Oni Shadowmancers and Half-Fiend Swashbucklers, from CR1 to CR21. Furthermore, half the $2 cover price will be donated to Save The Children, helping champion children's rights, fund education and fight poverty and disease worldwide. They're back! The Non-Terrifying Beasts of Legend return, for Halloween, for all time. Inside you'll find ten tales of horror, each with a fully fleshed monster. From the Devil Cat of Twistleharbour to the eldritch horror of Gabriel the Were-Toad, from the Ectoplasmic Cube to the Harmless Tyrannosaur, all are viable encounters of an especially... minor nature. Scare your players with innocuous foes! Spot the pop-culture references! All completely free! The Non-Terrifying Beasts of Legend, now for Pathfinder! All of the Non-Terrifying Beasts of Legend converted to the Pathfinder system, plus some new faces including plague zombie sheep, the haunted nickelodeon and the Horsemanless Head of Dozey Dell. Low-level horrors, tales of fear and suspense, all completely free! (c) 2006 The Creative Conclave.